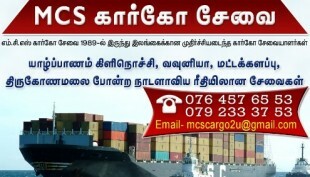 MCS Cargo is a Registered Company a subsidiary of Munasinghe Tours and Trade GmbH, in Zurich, Switzerland. We are the pioneers in the Cargo Service to Sri Lanka from Switzerland since 1989. And we have rendered a good service to more than 2000 satisfied customers in Switzerland.